!!! !SHAWLS FOR POETS IN NEED!!!!! 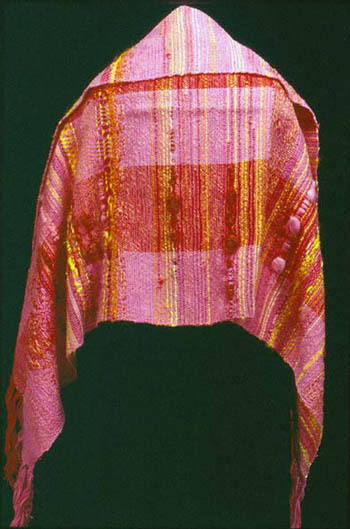 Courtesy of Maria Damon, beautiful shawls created and donated to support Poets In Need, Inc.
Textual textiles blend traditional appalachian folk patterns with rainbow colors and a variety of textures to create a happy poeisis you can wrap your mind around and vice versa. Mostly wool and cotton, a bit of synthetic and sometimes metallic. 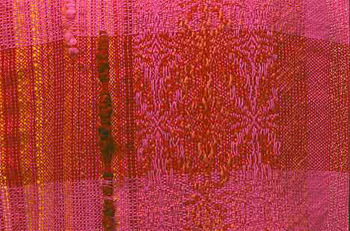 Approximately 32" wide x 77" long, including 8" fringe. Special orders (if you've got a general color scheme in mind) welcome. No 2 are alike. $200 or best offer (don't be shy, make an offer), plus $7 shipping and handling. ALL proceeds go to directly to Poets In Need, Inc.
Maria can be reached by e-mail at damon001@umn.edu. Poets In Need is a non-profit organization providing emergency assistance to poets who have an established presence in the literary community as innovators in the field and a substantive body of published work. Assistance is give only in cases of current financial need that is in excess of and unrelated to the recipient’s normal economic situation and that is the result of recent emergency (due, for example, to fire, flood, eviction, or a medical crisis). Poets In Need was founded in 2000 by Board Members Michael Rothenberg, Norman Fischer, and Leslie Scalapino. Lyn Hyjenian, Hal Bohner, and Suzi Winson also serve on the Bord. Poets In Need is a non-profit (501(c)3) organization. Donations are tax-deductible. Yes, I want to help poets in need.